First trip out to The Coal Mine Theatre last night to see the company’s production of August Strindberg’s Creditors, adapted by David Greig and directed by Rae Ellen Bodie. An intimate space (at 798 Danforth Ave., below the Magic Oven), Coal Mine is a storefront-style space – in this case, the black box has been set up with thrust staging, the audience in a tight horseshoe around the playing area. All the better to be flies on the wall for this trio of love, jealousy and revenge, played out in a series of three two-handed scenes. Watching Creditors is like seeing Shepard meets Chekhov – the characters are embedded deeply under each other’s skin, and love is obsessive, desperate and even child-like. You just know that it will all end in tears. Gustav (Hardee T. Lineham) meets Adolph (Noah Reid) at a bayside hotel, where Adolph is staying with his older wife Tekla (Liisa Repo-Martell). Under the guise of being friendly and helpful, Gustav proceeds to burrow inside Adolph’s head, sewing seeds of doubt in himself, his work as an artist and his marriage. The devil appearing with a smile and a caring tone, offering assistance even as he lays waste all in his path (see Lineham talk about Gustav and evil here). Creditors is a period piece that roars today. Darkly funny and acutely intelligent, it’s a sharp look at relationships, and how those involved are molded and changed. How imperceptibly the thoughts, ideas and expressions of the one you love can seep into your consciousness. It is a powerful examination of the power dynamics of older and younger, experience and innocence, artist and muse; the give and take of relationships. And in that taking, one becomes indebted to one’s husband, wife, lover – particularly where there is an imbalance of power and especially when one has taken too much. One will always owe the other. And if you run out on your bill, someone may come after you. Bodie brings an excellent trio of actors to this power play of obsessive love and revenge. Reid’s Adolph is boyishly sweet, naïve and guileless, possessing of a pliable, open-mindedness that may appear weak at first, but is more about youthful optimism and energy. Manipulated by Gustav, the starry-eyed young lover turns green-eyed with jealousy, his crutches and poor health an outward sign of his inner frailty. Lineham’s Gustav is deliciously understated in his evil intent; calculating, bitter and vengeful – but seasoned enough to know that vengeance is best served cold. It is both fascinating and abhorrent to watch as he plays puppet master to Adolph and Tekla, making them dance to his tune and then cutting the strings. Repo-Martell is luminous as Tekla; older than Adolph and beginning to feel her age despite the nervous girlish giggle she maintains, while she loves passionately and fully, she is forever dissatisfied – her first husband too old and her second too young – a spider caught in her own web. And yet, we feel for her as a woman whose options are limited, living in a time in which a woman must live through a man. With shouts to composer Ted Dykstra for the lovely, cascading classical piano arrangement; Andrea Mittler’s lush set, with its oriental rugs and golden frames; and Ming Wong’s rich period costuming. Creditors is a delightfully vicious melodramedy with laughs that bite and a stellar cast. 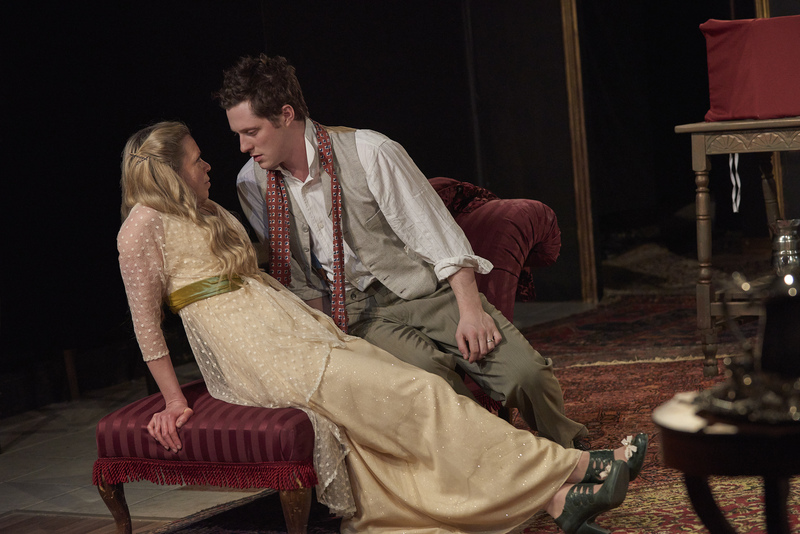 Creditors continues its run at the Coal Mine Theatre until May 17. Advance tix are strongly recommended – you can purchase them online here. In the meantime, check out these other video chats: Repo-Martell talks about relationships within the play and Reid talks about the cutting comedy. You can also keep up with Coal Mine Theatre on Twitter.